Here is a rundown of articles I have written as the Associate Editor for Voices for The Shakespeare Standard. Click the title to read the entire article. Shakespeare intersects numerous aspects of our everyday lives. Funny enough, the Bard intersected a lot of my favorites themes in this week’s Voices. Magic. What is in common with Harry Potter and Shakespeare? Ralph Fiennes! “Actor Ralph Fiennes is hoping Harry Potter fans will be lured to watch Shakespeare when he stars in The Tempest in London’s West End.” Lord Voldemort will transform into Prospero this time around. 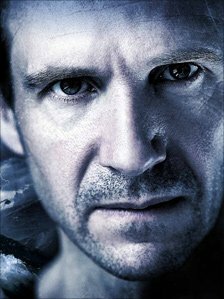 Ralph Fiennes has been widely acclaimed and recognized as the main antagonist in the Harry Potter Series, despite the heavy prosthetics, and will now play a protagonist forThe Tempest. This could be an arena for Shakespearean voices to intersect into the popular audience. From the trunks of Hogwarts, a lead casket has been opened. Bronze Casket. Its adorable to open the first bronze casket from an adorable girl. 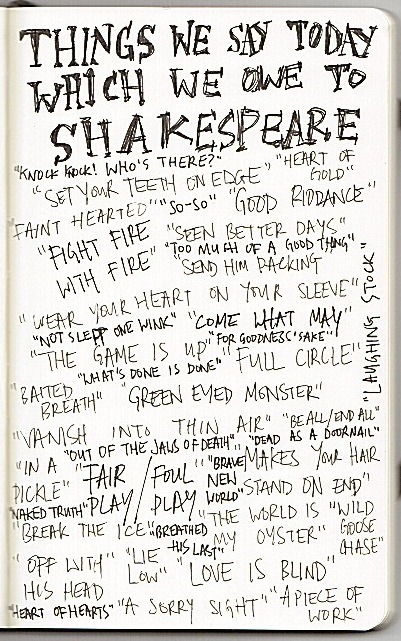 She wrote in her moleskin notebook about the phrases we use everyday that we owe to Shakespeare. It went viral. Though a lot of people also sent in their corrections, it’s still something that it went viral in the first place. People do still find Shakespeare interesting. Its always a good start. It received various reports, even from the Shakespeare Geek. Its a bronze voice worth listening to. Starving Artist? Yet you want to watch the Bard and other plays? Well, Orlando Shakespeare Theater now offers a “Starving Artist” Pass for those employed in a non-profit art organization. 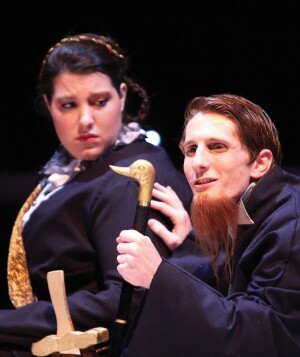 Matthew Palm reports”Orlando Shakespeare Theater in Partnership with UCF is offering an opportunity to those employed by nonprofit arts organizations to purchase tickets for the 2011-2012 season at a reduced rate with a “Starving Artist” pass. Starving Artist passholders will receive one ticket to each of Orlando Shakespeare Theater’s six Signature Series productions for only $30. (Limit two per person).” This is certainly good news and a show of much needed appreciation for artists, art lovers and cultural workers who love to go to the theatre but may not always be able to afford it. They want to hear the Bard’s voices most, but usually can afford it least. The debate for the Bard’s lovers and haters… Care to join them? Personally, I think its just another Hollywood sparkling golden casket. So, let’s hear them out. Newsweek Magazine’s The Shakespeare Shakedown. They say don’t buy it, so do I.
Sam Blumenfeld, author of The Marlowe-Shakespeare Connection, says its Marlowe who wrote Shakespeare and that his book should’ve been the one turned into a movie rather than Anonymous in his column Who Wrote Shakespeare? for The New American. I guess everyone just wants a piece of the Bard. What is up for this week? My newsfeed is still abuzz over Anonymous. But honestly, are you as over this hype as I am? The facts are out there, the most disturbing aspect is the distribution of the “documentary” to schools where it confounds students. Why can’t we just give respect where it belongs. Clearly, this glitzy and glamorous golden casket is just plain that. Moving on, remember the Subway Shakespeare? Now we have Shakespeare on an elevator! Hillard reports, “Rothhaar and Pasqualini are part of Salty Shakespeare, a California theater group dedicated to bringing Shakespeare to public spaces in a way that penetrates the electronic wall that often surrounds us. 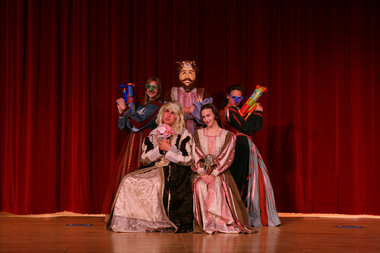 The group has performed on Venice Beach and currently has plans to take Romeo and Juliet to a shopping mall. Back on the elevator, once the doors open, people move quickly. Not all of them realize that they’ve just witnessed a performance.” Now this is an interesting bronze casket. I wonder when I will ever run into the Bard like this. This deserves a round of applause. There is nothing like laughter to bring Shakespeare closer to the people. As was my habit in Portia’s Caskets, I love looking for bits and pieces that will develop the love of the Bard and bring him closer to everyone. No, he is not an Earl; he is an ordinary person, just like most of us, and it never stopped him from creating the plays that we all know and love. Our own respective status will not stop us from being what we want to be, Shakespeare is one of the best inspiration of that belief. Stratford-Upon-Avon, keep up the fight. Such fun and laughter is inspirational in the works of children, “Next weekend, the students at Bernards High School will present The Complete Works of William Shakespeare (Abridged), a play that takes a jab at all 37 of the Bard’s works in a production that runs just under two hours.” We can all remember our high school Shakespearean readings, but for Lynn Weltler, director of Bernards High School’s theater program, “Now imagine if the female characters wore bad wigs and overacted like the actors on Saturday Night Live.” Hopefully, more schools will follow their lead for a fuller Shakespearean experience. Hello dear readers, sorry for the bit of delay for today’s Portia’s Casket. Our second semester just begun and everyone is busy catching up, including me. Once again, I play a dual role of a teacher and a graduate student. 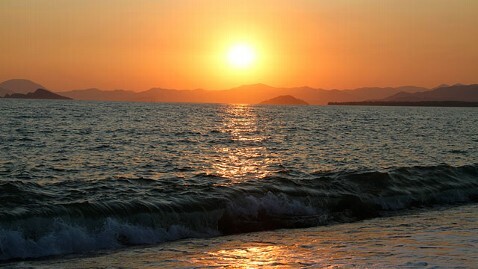 Such longing for the recently ended vacation brings me to our first casket, Shakespeare, Global Warming, Sunset, and You. Bill Blakemore starts with this reflection, “Imagine you’re reading Shakespeare on an unseasonably warm evening while sitting on a dune looking west across the sea at sunset.” How I wish I can ponder the authorship debate in this setting. There is nothing like this relaxed atmosphere to wonder about various issues that are plaguing us, “You watch the reddening sun move down toward the horizon until the bottom edge of the bright disc drops behind the rim of the sea. The still visible portion of the sun morphs into various shapes as it moves inexorably down until it’s just a tiny point of light. Then, as you can plainly see, it is suddenly gone as the sun travels even further below the horizon.” But he is also right, the sun does not sink in the horizon, it is the earth that actually moves, so it is us that must also move. Difference. Most times, it is difficult to be so different from others. But this difference makes us special. Shakespeare helps us express this. His plays and our adaptations of it often focus on difference. And this difference makes the practice of the Bard amazing. Everybody is back from the Thanksgiving hiatus. Its good to be back. How did Shakespeare speak to us this week? Here is the rundown. I started with Ralph Fiennes and ironically, I also ended up with Ralph Fiennes. Writing Portia’s Casket has been rewarding. 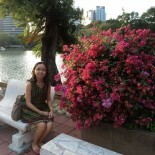 I hope to write more for The Shakespeare Standard and I always hope for more readers. Let’s keep on opening the Bard’s Caskets! This entry was posted on December 1, 2011 by Portia Placino in Shakespeare and tagged Moleskine, Portia's Casket, Ralph Fiennes, Shakespeare News, The Shakespeare Standard, Wednesday Voices, William Shakespeare.